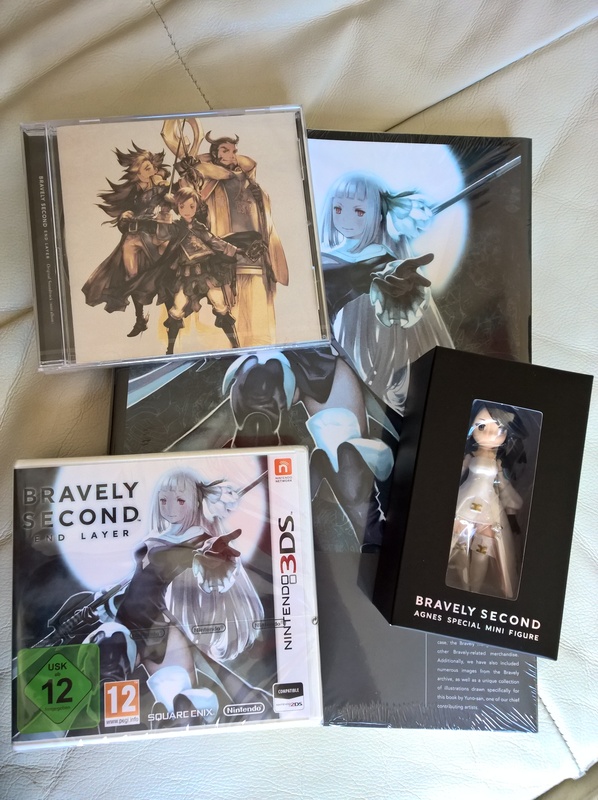 Bravely Second Deluxe Collector’s Edition: What’s in the box? Tomorrow, the sequel to one of the 3DS’ most celebrated jRPGs hits European shores, as Square Enix’s Bravely Second: End Layer lands on store shelves. Like Bravely Default before it, the sequel is also getting a deluxe collector’s edition, and because I bought that, I also bought this. Because I’m a sucker for limited editions. So, what’s in the box? Well, it’s a similar deal to the first game, containing a large art book (the main draw for me), a figurine and a mini soundtrack CD alongside the game – there’s no pack of cards this time, however. 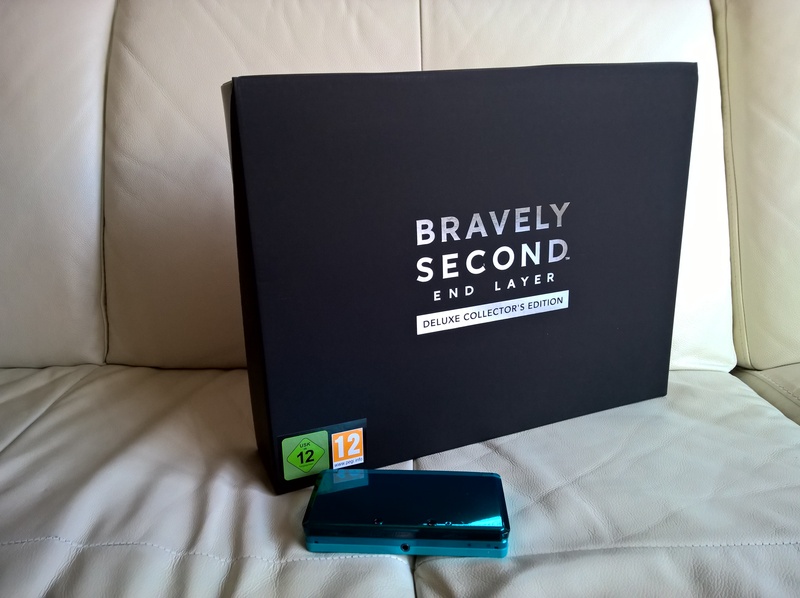 One of the things that surprised me with the original game’s limited edition was the size of the box, and there’s little change here; while the box is a different shape, it’s still huge. Where am I going to put this thing!? 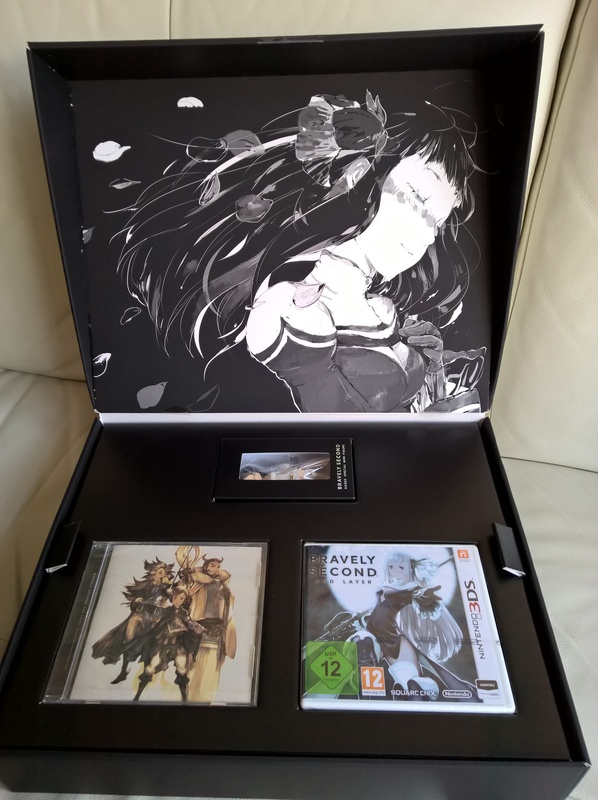 Opening the box, we’re greeted with a lovely piece of black and white art of new character Magnolia on the inside lid, as well as a look at the game box, the soundtrack CD, and the miniature figurine of Agnes in a small box, all sitting in a cardboard tray. Lifting out this tray, we find the art book hiding underneath. Below, you can get a look at the full contents of the box, before we take a closer look at a couple of the items. Probably the only complaint levelled at Bravely Default‘s collector’s edition was the quality of the included Agnes statue. While quite large and weighty (I believe it’s made of polystone), the paintjob was pretty messy, and it just didn’t really look like Agnes at all. 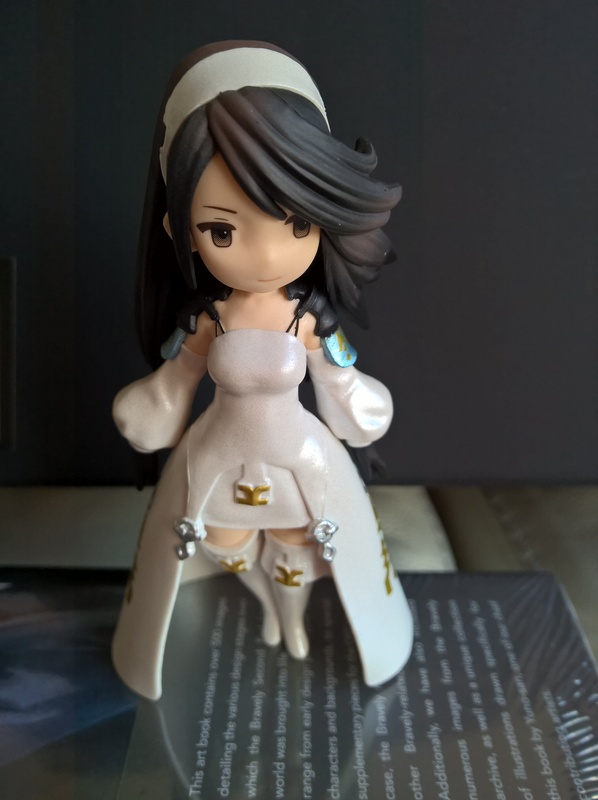 That’s been fixed for Bravely Second; while the figurine is much smaller and made of plastic, it actually looks like Agnes, and is a much greater representation of both her in-game look and Akihiko Yoshida’s artwork. In the gallery below, you can see a comparison of the two, but here’s a close look at the figure itself. 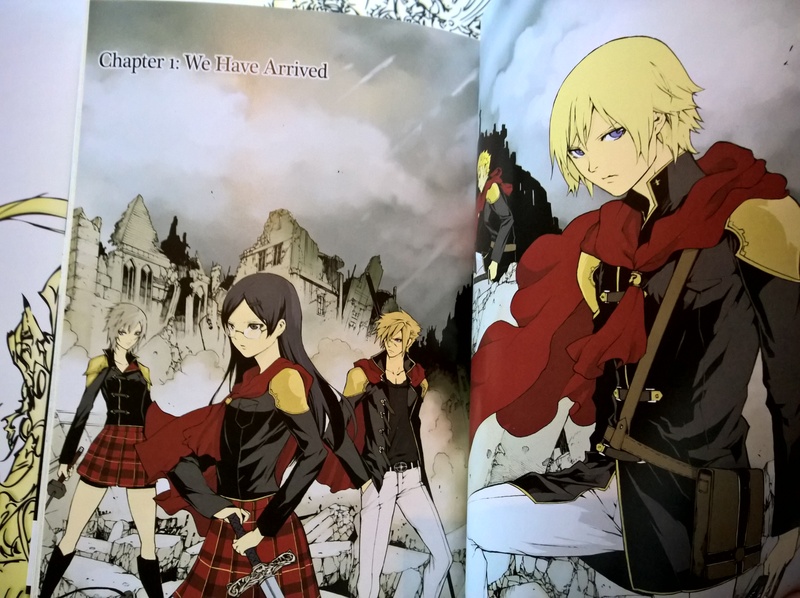 Last up, here’s a look at the art book, the headline item as far as I’m concerned. 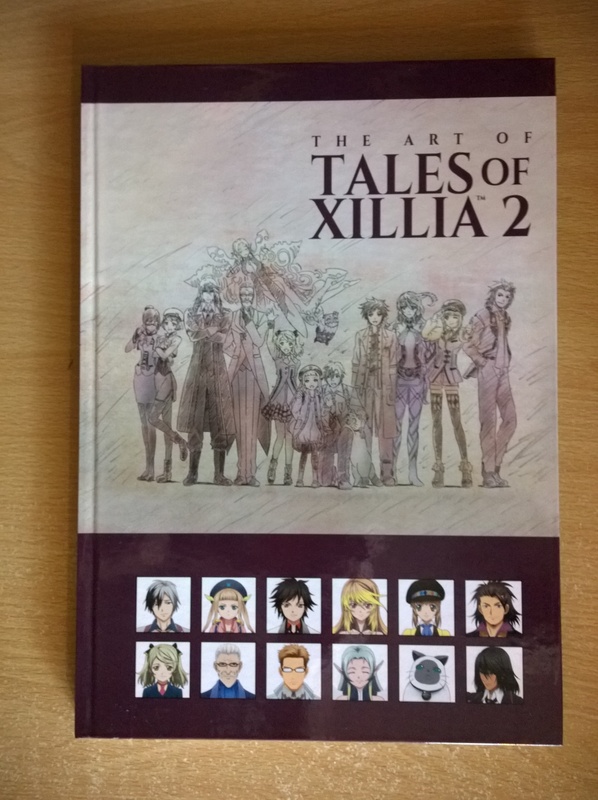 Unfortunately, it’s not hardback like the original game’s book, however, we’re getting a much thicker tome this time, and it’s not just an art book. Here we have a full design works book, collecting production sketches and artwork from right across the game’s development. Included are the original Japanese notations, complete with English translations. I haven’t looked too deep into it for fear of spoilers, but a quick flick through suggests this book will be an absolute must have for fans. Also, upon opening it, we’re treated to that same piece of artwork of Magnolia that I mentioned earlier, only this time in glorious colour. See more, including a couple of comparisons with the original book, in the gallery at the end. Overall, I’m very happy with my purchase. Coming in a little cheaper than the original Deluxe Collector’s Edition, with a couple of definite improvements over some of the included items, it’s a nice treat for fans. Now I just have to find the time to play the game! For now, enjoy the gallery, and the game if you’re getting it this week. The ten-track CD features some nice artwork on the cover. Upon opening up the art book, we see this lovely colourful piece of art. Some images, complete with annotations. While the first one is hardback, the new book is much thicker and has more than just art. It may not look thicker here, but that’s just down to the hardback. Bravely Second’s Agnes is much smaller, but much better. Though you probably don’t need me to tell you that. 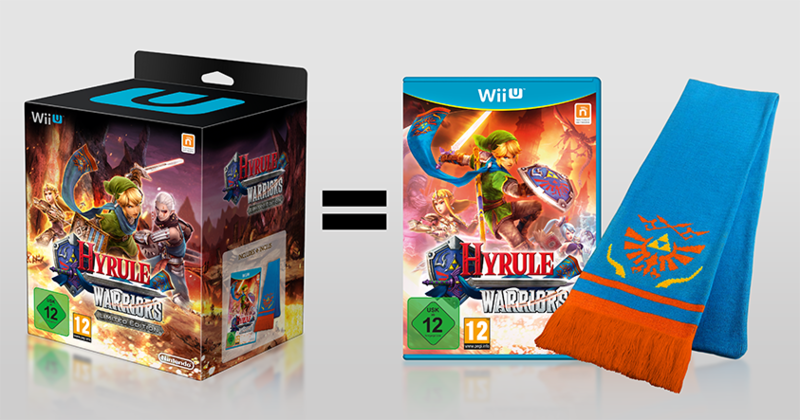 It is the most pre-ordered new IP ever, after all. And of course, in a move that will surprise absolutely no one at all, I bought the limited edition. 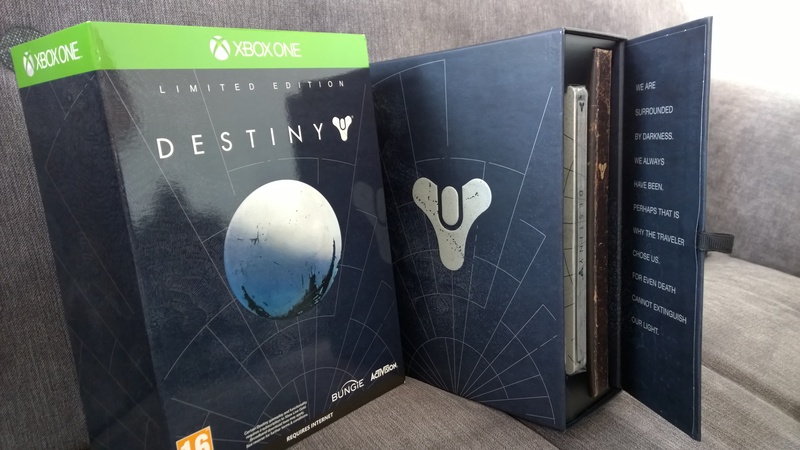 No, sadly not the Ghost Edition – I would have, but I’m having to buy the game on both Xbox One and PlayStation 4, so that would have been ridiculously expensive all-in. Nope, I went for the ‘standard’ limited edition, if that makes any sense at all. My PS4 standard edition hasn’t managed to find its way here yet, but my XBO order has, so while it’s installing, enjoy some pics, and if you’re going to be playing Destiny this weekend, maybe I’ll see you starside. 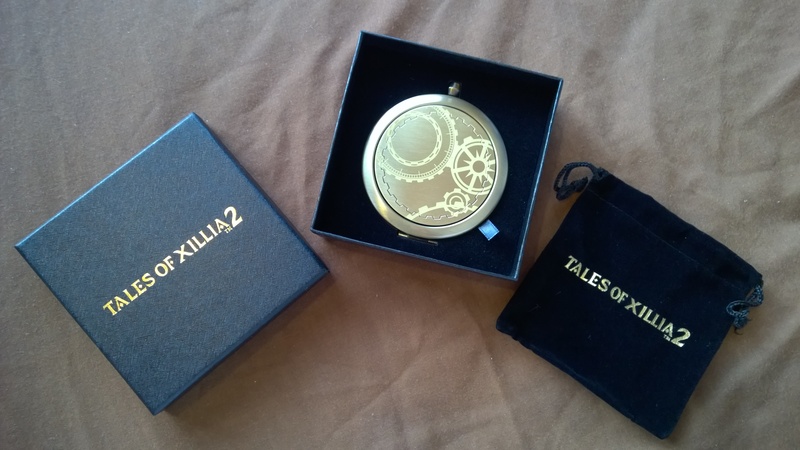 This time last year, I was unboxing my Tales of Xillia Milla Maxwell Edition, and now here I am with a look at the equivalent edition for the game’s sequel, which this time comes in an even larger box. 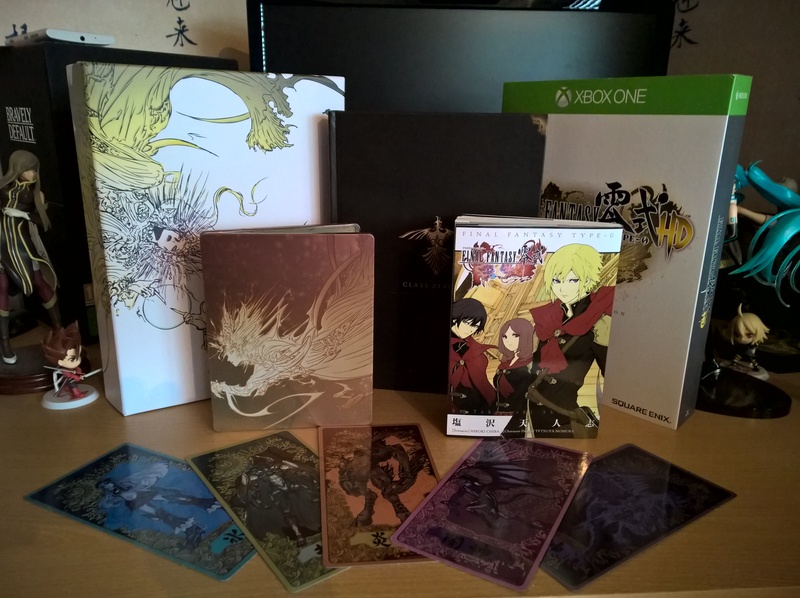 However, stuffed into that box is a collectors edition that is improved in many ways over last year’s Milla Maxwell set, with an additional item thrown in, a far better art book, and the game and soundtrack selection this time housed in a nice steelbook featuring Ludger’s overweight cat Rollo. I like steelbooks, but it does mean I won’t be able to get this game signed in the future, like my copy of Xillia. 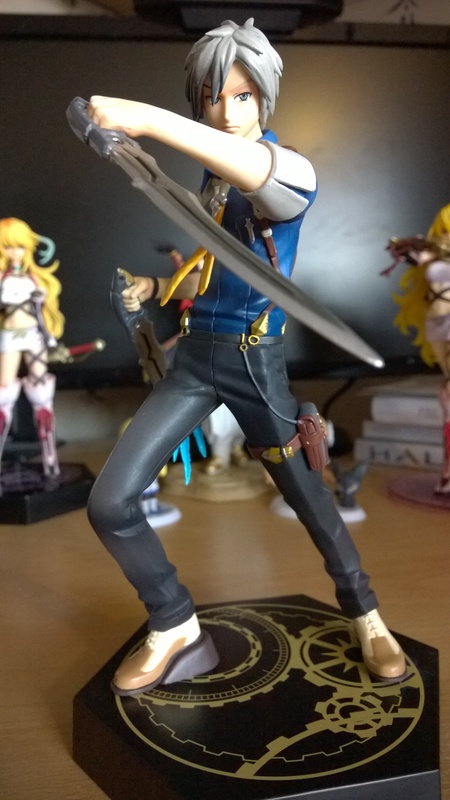 Obviously, the headline feature of this edition is the figurine of protagonist Ludger Will Kresnik. Like last year’s Milla figure, it’s good quality (though not quite up there with Alter’s line of Tales of figures), but it’s not quite as striking as Milla, for me. That’s mainly because I feel Ludger’s design is more conventional than that of Milla, and, dare I say it, a little bland. Still, it’s a nice figure, and you can get a decent look at it below. Next up we’ve got the art book, which is a massive improvement over last year’s. This time, it’s not only a full-size book, but it’s hardback too. 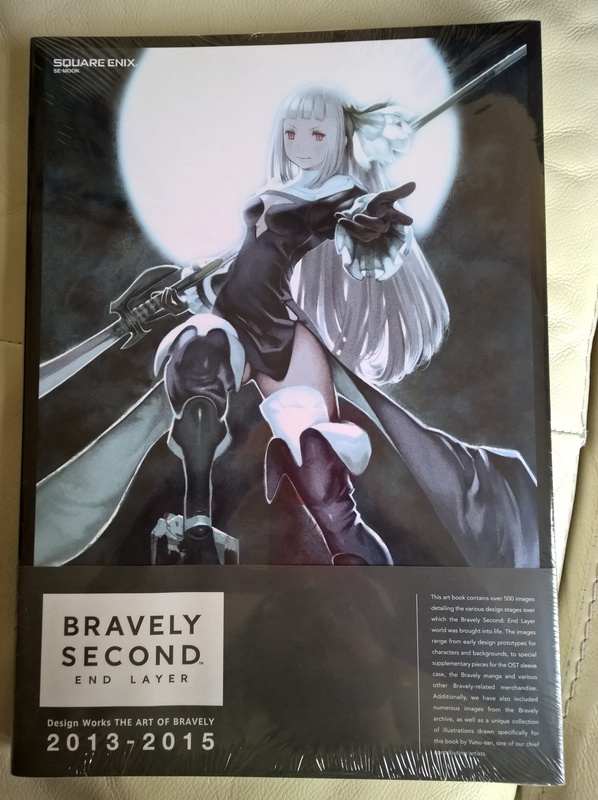 I’ve mentioned many times that I much prefer larger, hard-bound art books, so I’m very, very pleased with this and it reminds me a bit of the book that came with the Bravely Default Collectors Edition. I’ve yet to take a proper look at it as I don’t want any accidental spoilers, so it’ll sit on my shelf until I’ve finished the game. That extra little trinket I mentioned? It’s a replica of Elle’s pocket watch from the game. Except it’s not actually a pocket watch – open it up and you’ll see that it’s actually a compact mirror, with clock detailing on the other side. Made of metal, it’s a nice, weighty piece and a fun in-universe extra. I don’t know that I’ll ever use it for its intended purpose, but then I’d never have used a pocket watch either. It comes in a nice black presentation box which also includes a small black pouch to keep your trinket in. 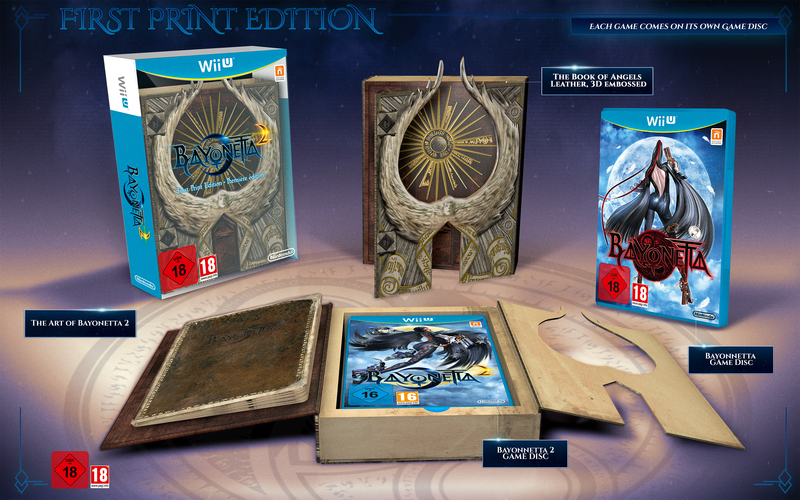 Lastly, there’s the steelbook, which houses both the game disc and soundtrack selection. I’ve not looked at the second disc yet, but I expect it’ll hold a small handful of tracks from the game (the disc that came with the Milla Maxwell Edition was 12 tracks, for instance). 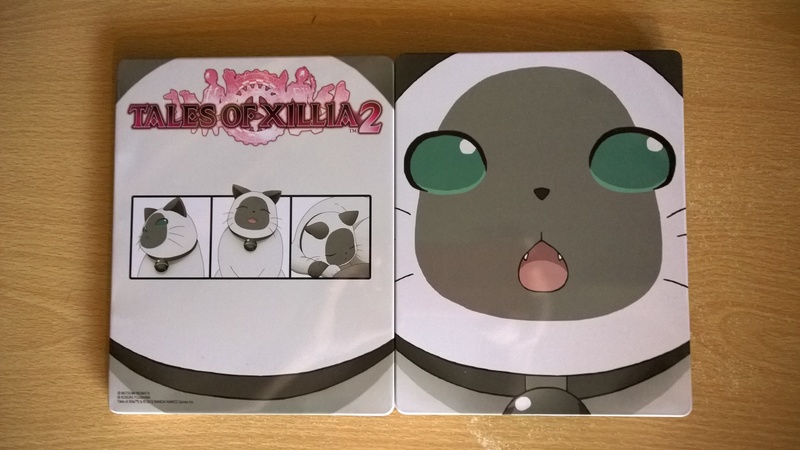 It’s a nice steelbook, featuring the face of Ludger’s rolly-polly cat Rollo on the front, as well as a few skit portraits on the back. As I said above, I like steelbooks – I’ll usually seek them out if there’s an offer for one somewhere – but I actually prefer the steelbook that comes with the game’s Day One Edition, which is covered in colourful art from the game. I have to admit that I very nearly ordered the Day One version in addition to my Ludger Kresnik Edition just to get that case, but thankfully came to my senses. Overall, I’m pretty happy with my purchase, just as I was with my Milla Edition last year. And now I have yet another character to add to my Tales of figure collection, which you can see in the gallery below, where I’ve added a few more images of the Collectors Edition. Now all I need to do is finish my second playthrough of the first game before I can get stuck into Ludger and Elle’s adventure in Tales of Xillia 2. Today marks the European release of Ubisoft’s gorgeous RPG/platformer hybrid Child of Light. Built on the UbiArt Framework, the same engine powering the recent 2D Rayman games, Child of Light is a downloadable fairytale-inspired title written by Far Cry 3 scribe Jeffrey Yohalem. The game stars Aurora, daughter of an Austrian duke who wakes in a dream-like world and must find her way back to her own reality, meeting up with a number of companions along the way, including the helpful blue firefly Igniculus. I pre-ordered the Deluxe Edition, which contains a download code for the game, a 24-page art book packed with plenty of beautiful concept art, a light-up Igniculus keyring, some DLC extras, and, curiously, a poster by famed Japanese artist Yoshitaka Amano. Aside from the development team possibly being influenced by his work, I’m not quite sure why it’s there – as far as I know he didn’t work on the game. 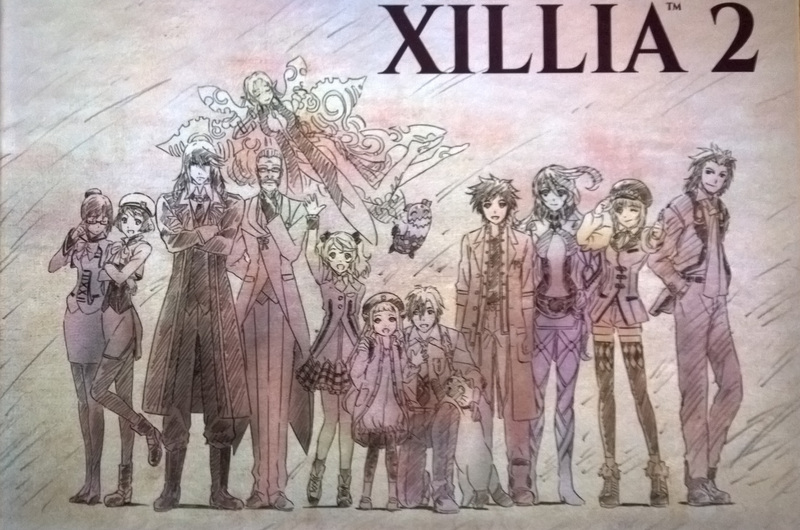 I’m not complaining though, being something of an Amano fan (and an owner of this), and it’s an utterly glorious poster. Images of it don’t quite do it justice; it’s rich in both colour and detail, and printed on thick, high-quality stock. It’s just a shame that it’s been tightly folded to fit in the box as I’d love to frame it. I decided to try out the PS4’s video recording features for the first time, and made a video of the first fifteen minutes of Aurora’s adventure, which you can see below. Curiously, the game seems to strip out audio during gameplay, making my video oddly silent. Considering that the intro cutscene features full audio, I can only imagine that this is a ‘design decision’ by Ubisoft – I tried making a few other videos from the game and sadly came up with the same results. It’s a strange decision on Ubisoft’s part – perhaps it’s to do with licensing issues surrounding Cœur de pirate‘s soundtrack. Either way, it means you can’t enjoy the game’s audio, but you can still get a look at the game’s lovely visuals, and read on below for my impressions from my brief time with the game. I managed to play the first half-hour or so and thought I’d get some thoughts down on (virtual) paper. The first thing you’ll notice is the visuals. This is an exceptionally pretty game. Screenshots and videos don’t quite manage to communicate just how beautiful the hand-drawn art that makes up the environments Aurora must travel through is. You really need to see this in all it’s glory on your big screen to fully appreciate it. The soundtrack is nicely understated, allowing you to focus more on the visual side of the presentation, though I think I’ll have to pay a bit more attention to it next time I play it, as all I can remember now is that it didn’t get in the way. 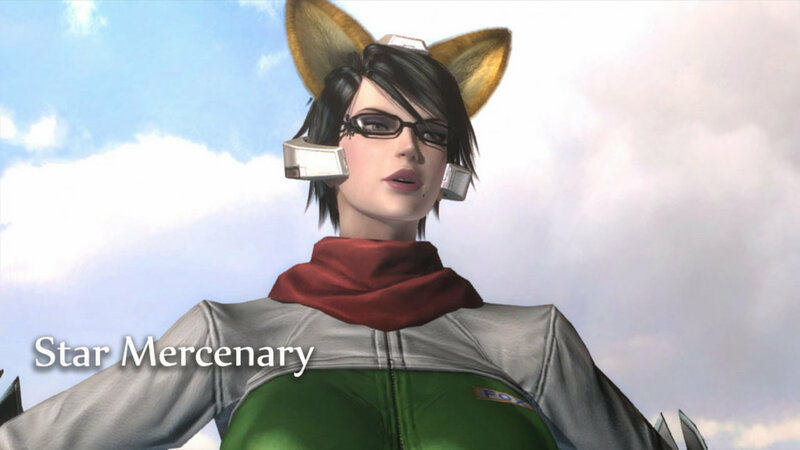 In terms of gameplay, I was strongly reminded of two games, at least in the early stages. The first of these is Limbo, Playdead’s puzzle-platformer from 2010. I said at the top of the piece that Child of Light is something of a hybrid between two genres, with the platforming seeming to take up the majority of your time. It has a similar minimalist feel to Limbo, a similar pace of movement and a similar floaty jump. Just as in Limbo, one of the first things you’ll do is grab and push a block to reach a higher platform. There’s also some light puzzling to contend with, which I hope will continue through the game and provide some decent head-scratchers. None of this is a bad thing, considering what a playable game Limbo is, but of course Child of Light doesn’t share the former game’s bleak, lonely tone. It’s not long before you stumble upon Igniculus, who you have to control with the right stick (or the DualShock 4’s touchpad) and right from your first meeting you’re gently taught how he can help you out. While platforming, Igniculus can whizz around the screen collecting glowing orbs (which can help to refill Aurora’s HP and MP) as well as holding enemies in place to allow Aurora to get in position for a back attack. Of course, Igniculus can also help you out in battle. Fighting is a different proposition altogether, taking the form of a turn-based battle system in the grand old jRPG tradition. Aurora stands on the left of the screen, her enemies on the right, and at the bottom of the screen is the time bar, with icons moving along it representing both Aurora and her enemies. The last quarter of the bar is the casting bar; every action has its own cast time – the more powerful the attack, the longer the cast time, and anyone who takes a hit while casting may find their attack cancelled and be pushed back down the time bar. If you’re reading this and thinking, “Hmm, that sounds an awful lot like Grandia“, then you’re right. Because it’s lifted straight out of Grandia. Of course, in Child of Light, we also have Igniculus on our side, and using the right stick we can hinder enemies, slowing their progress along the time bar to give Aurora a chance to get an attack in. It’s very rewarding to be able to get a strike in with Aurora, delaying an enemies attack, and then use Igniculus to hinder the same enemy, allowing Aurora to overtake them and strike again before your opponent has even had a chance to retaliate. Igniculus’ ability to slow an enemy isn’t unlimited however, as it’s governed by a meter (which can often be refilled by gathering blue orbs in the corners of the screen) meaning that rather than being a win button, it becomes a resource that you have to use effectively to gain the upper hand. This being an RPG, there are of course level-ups and skill trees, though I’ve only levelled up once in my short time with the game, choosing a ‘Starlight’ ability that hits dark-aligned enemies hard. A few reviews I’ve read have mentioned that the game is very easy on the default normal difficulty, so I started the game on hard, hoping for a bit of a challenge. I want an RPG to expect me to make thoughtful, effective use of both my abilities and build, so hopefully the hard setting will offer that kind of experience. I do have a couple of minor issues that I hope will ease as the game goes on though. Firstly, all of the game’s dialogue is told in rhyming couplets, and these can be quite forced at times, eliciting the odd groan. In general, the dialogue is solid enough (and I have no doubt that this is eased somewhat by the fact that none of it is voiced), but setting yourself the challenge of telling an entire story in rhyme pretty much ensures you’ll have to fudge it every now and then. For the most part, it manages to help sell the dreamy fairytale setting, but don’t expect it to be flawless. Secondly, unless you’re playing in co-op, you’re expected to control both Aurora and Igniculus at the same time. Aurora is on the left stick, with Igniculus on the right, and it often means you’ll stop moving one so that you can control the other with greater ease. In battle, this isn’t much of an issue; when Aurora can take action, the game will pause, giving you time to move Igniculus near an enemy in case you need to slow them down and then choose an action for Aurora to carry out. In platforming, it can slow your pace somewhat – if you leave Igniculus in place and move Aurora he won’t follow, so you find yourself trying to move both at the same time so as not to leave him off-screen. Hopefully, both of these issues will prove to be minor niggles that I’ll get used to, as I’m really enjoying the game so far. I can see myself flying through it over the next few days – reviews peg it in the range of 12-15 hours, which, while admittedly short for an RPG, is fine for a downloadable title. It’s genuinely surprising, not to mention encouraging, to see a huge, AAA-publisher like Ubisoft not just taking a punt on a smaller downloadable title like this, but actually getting behind it too, putting out plenty of ‘behind the scenes‘-type videos on Youtube to drum up interest in something that isn’t the usual huge-budget sequel. More like this please, games industry!